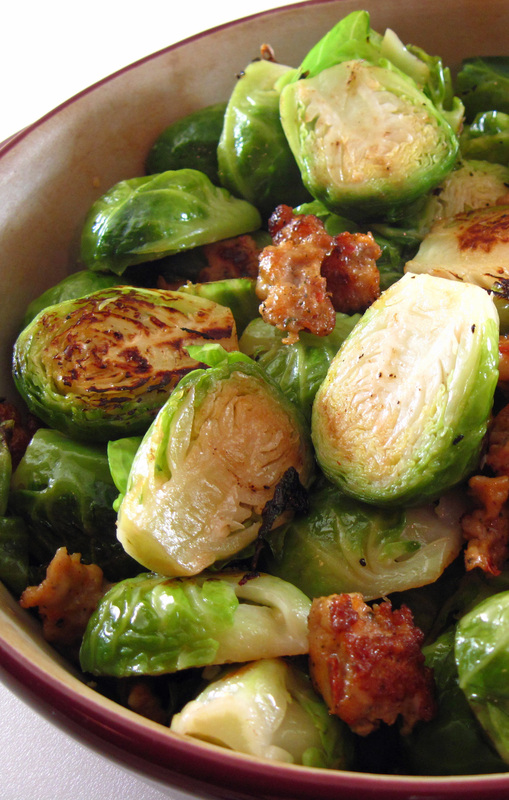 Today I present a new recipe, Brussels Sprouts with Sausage, from Mark Bittman’s brand-new cookbook, How to Cook Everything Fast: A Better Way to Cook Great Food. I can’t wait to get my hands on it; I pre-ordered it and it will be delivered 1 week from today. One could argue that I already have too many cookbooks, including several by Mr. Bittman. So why do I need this new tome of 2,000 recipes? If you’re at all familiar with my blog, you know that I am a Mark Bittman “groupie”. I love his simple instructions and relaxed attitude. Don’t have a certain ingredient? Use something else. In fact, he usually offers suggestions for substitutions. The message in all of his books: Don’t make cooking harder than it needs to be. Cooking delicious meals with real food does not need to be difficult. I always learn new and useful information from his books. Even his most basic cookbook, aptly titled How to Cook Everything the Basics, taught me a thing or two. My current favorite roast chicken recipe is from that book. Anyway, I am eagerly awaiting my new Mark Bittman cookbook. The Seattle Times recently published an article about Bittman and included two recipes from the new book: Fastest Chicken (or Eggplant) Parm and Brussels Sprouts with Chorizo. Since I had Brussels sprouts in the refrigerator I decided to try that one. I wanted to use Isernio’s Chorizo, but the store I chose was out of it. They did have Isernio’s Hot Chicken Sausage so I bought that. Bittman had suggested that chorizo, sausage or bacon could be used for the recipe. The sausage was really good, but I think chorizo would make it even better! I used ghee since I had just made a fresh batch, but you can also use olive oil as the original recipe suggests. 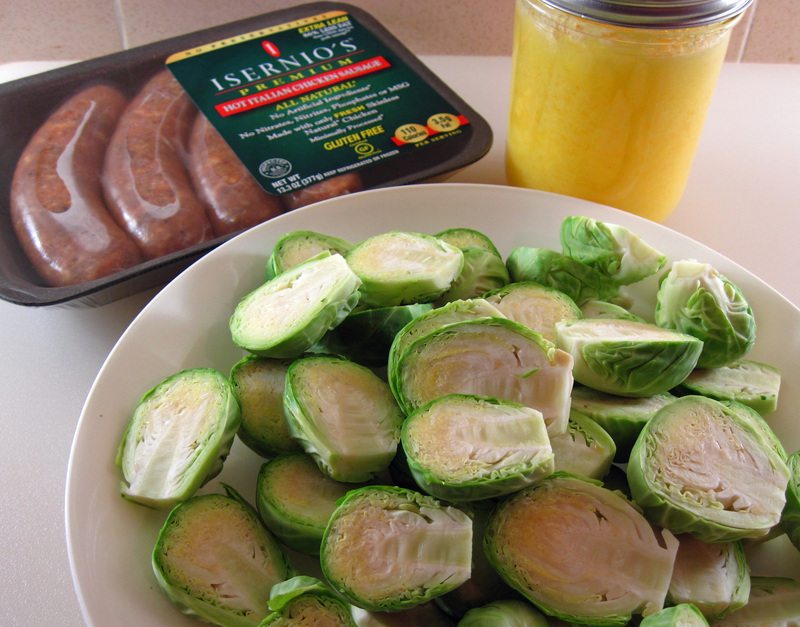 Trim the Brussels sprouts and cut them in half. Heat the ghee in a large skillet over medium heat. 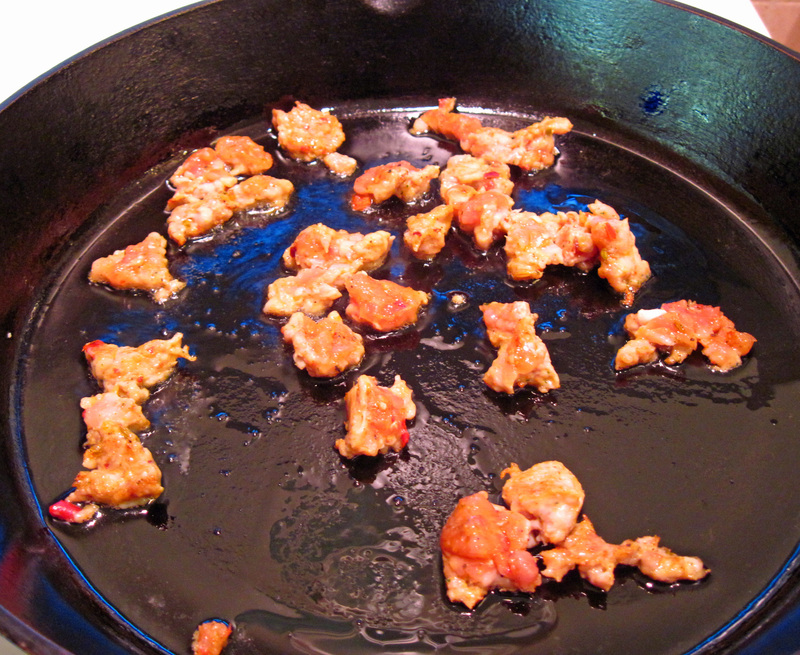 Add the sausage and cook, stirring occasionally, for about 3 – 5 minutes. 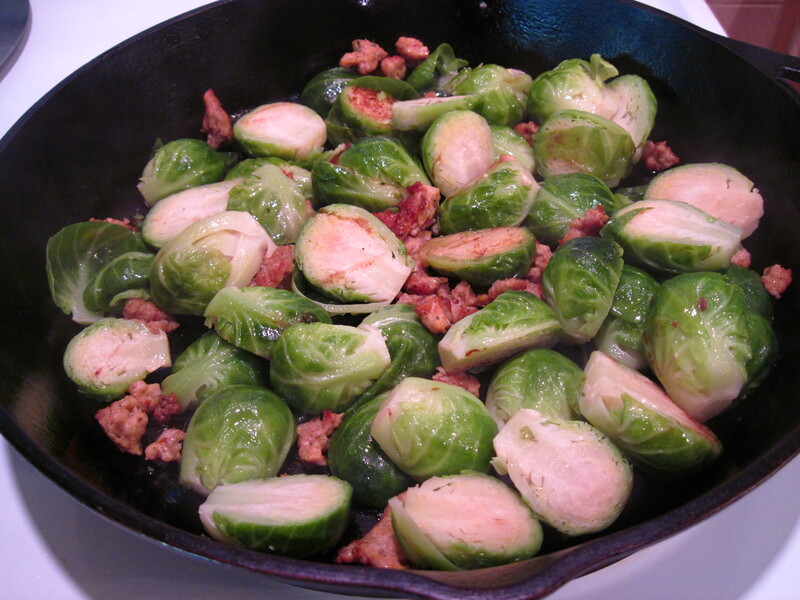 Add the Brussels sprouts to the skillet. Add the ½ cup of water. Sprinkle with salt and pepper. Cover and cook for about 10 minutes, or until just tender. (Smaller sprouts may take less time.) Check on them a time or two and add a bit more water, if necessary. When the sprouts are just about done, remove the cover and raise the heat to medium high. Cook, stirring just once or twice, for a couple of more minutes. The liquid should evaporate and the sprouts should be starting to get brown. Taste and add more salt and pepper if necessary. Serve hot or warm. I can’t wait for his new book either!!! 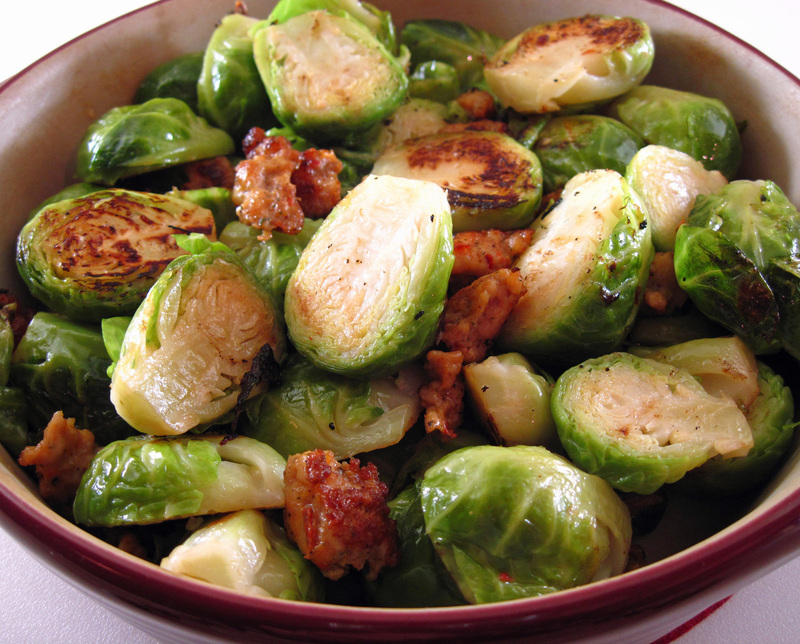 This recipe looks good, I love brussel sprouts! I know that this post is very old and may not get an answer but I’m going to try. Can more sausage be added to make this the “Main course” of the meal? Definitely, Netta! I think that’s a great idea.